“Our house was flooded with thick mud… we immediately grabbed our valuables and ran to a neighbour’s [two-storey] house to seek refuge,” said mother-of-two Lili Puji Hastuti, quoted by Agence France-Presse. The search for victims continues in the town of Sentani, one of the worst affected areas. Fifty-one people were killed in the town, national disaster agency spokesman Sutopo Purwo Nugroho said, quoted by Reuters news agency. The other seven confirmed deaths were in the nearby provincial capital Jayapura, Mr Nugroho added. However, a five-month-old baby was rescued in the city after being trapped under the rubble for hours, according to the military. Meanwhile a propeller aircraft was partly crushed on the runway of Jayapura airport. Flooding is common in Indonesia, especially during the October-April rainy season. 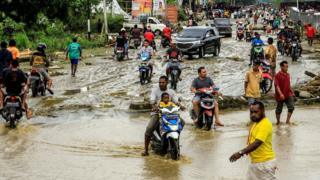 In January, floods killed at least 70 people on the island of Sulawesi, and heavy rain in West Java earlier in March displaced hundreds. Emergency officials say that in recent months they had warned the Papuan authorities of flood risks due to deforestation of mountains surrounding Jayapura. Papua province borders the independent state of Papua New Guinea, to the east.